What Are CEREC Single Visit Crowns? In the past, chipping a tooth may have been a devastating occurrence. It may have taken multiple dentist visits to fix. However, thanks to CEREC Single Visit Crowns, it is possible to repair a tooth in minutes and without discomfort. In the past, the only way to repair major tooth damage to visible teeth was with a porcelain restoration. To complete this procedure, it was necessary to prepare a tooth by slightly shaving it down and taking a mold. In a lab, layers of porcelain were applied to this model. Finishing the treatment usually took weeks. Throughout this period of time, a person had to deal with a temporary acrylic restoration, which was often uncomfortable and easily breakable. Today’s technology has greatly advanced the world of dentistry. It is now possible to correct major problems in a single visit. There is no need for molds, temporary crowns, or any injections. Through computer design and manufacturing, single visit crowns are a reality. For single visit crowns, a person’s mouth is scanned with an LED camera. This is quick and painless. A three-dimensional model is created through advanced computer software, and restoration is created on a different machine within minutes. It is ready to be permanently cemented before a patient leaves for the day. 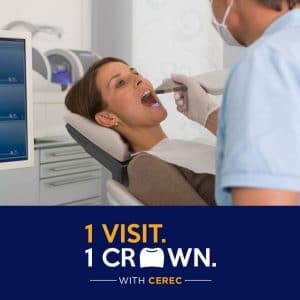 Cerec, or “one visit crowns,” bring a number of benefits over conventional crowns. Saves time and money from numerous dental visits. There’s also no uncomfortable temporary crowns, and your end results are extremely durable and look natural. If you are interested in CEREC crowns for your tooth restoration needs, we can help. This is just one cosmetic procedure that Dr. Walters performs to correct his patients’ smiles. To schedule an appointment or consultation, call the office at (614)686-7224.